So I am looking for a pump out for my Catalina 30. Either they are in a bay behind a bridge or annoyingly far away. After starting with the NYC DEP guide to pump outs, I am passed from Marina to Marina on the phone until i reach a spot in Staten Island, Atlantis Marina. The chart *seems* to show 3 feet *between* the buoys of the harbor. As expected the marina had no idea what I was talking about. What's with that? Google satellite imagery clearly shows sailboats in the harbor. And yes, I know the numbers are for mean low, but still, between the buoys? I am not familiar with US nautical charts. Are depths in fathoms, feet or meters? Does look a bit wierd. If in doubt stay inside the markers and go nice and slow. **Remember I have no local knowledge! Here's a proper link, and yes, soundings are in feet. Thanks for the link to the NOAA Chart. ActiveCaptain isn't quite up o date perhaps. I did call, they had no idea what I was talking about. Thanks for the fresh link. It seems activecaptain is not so up to date. but can you confirm that you would trust the latest NOAA over other chart providers? That's all of NY harbor. Pilings, old cables, high voltage power lines from the Ravenswood generators. Smog so thick the other I could not see the top of the towers of the Verrazano-Narrows Bridge. The Activecaptain page shows the NOAA logo. 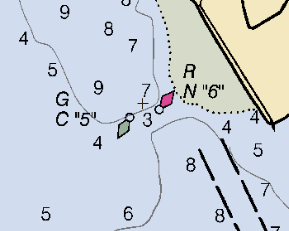 If I trusted the chart I would not be posting here or calling the marina -- or using my depth sounder. Edit: AHA! This is a 1984 chart. Mystery solved. It has been noted other places that NOAA has introduced some errors when they have digitized their charts. I suspect this is the case at that location. 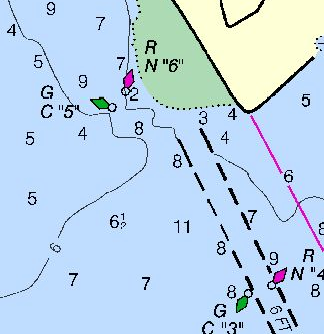 On the other hand, that channel has been known for shoaling so it could just be an old chart you were looking at. Often there is a SeaTow boat or TowBoatUS around that you can call and they will let you know what the latest information is, or you might be able to raise someone inside on the VHF. It is interesting how often pumpouts are either out of service or unavailable for some reason.